Click on RhinoDARK™ with textile metallic foil overlay for step-by-step video. 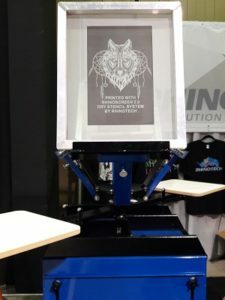 You’re totally covered in the digital, heat transfer department via game-changing heat transfer papers from RhinoTech. 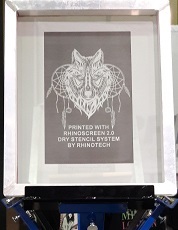 The line-up includes high performing laser papers for dark garments with RhinoDARK™. Inkjet options start with SingleJet™ Opaque. For white and light color papers, the choice is SingleStep™. Get bold and brilliant transfers with RhinoDARK™ . This laser paper is weedless and it offers excellent opacity due to a dimensionally-stable, polyester-coated image sheet. It’s durable with the ability to create both matte and gloss finishes. 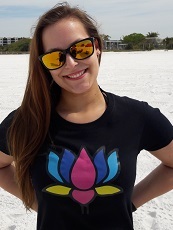 And, because only the toner transfers, opportunities exist to increase the value of this and other digitally heat transferred images with application of rhinestones and textile metallic foil overlay. RhinoDARK™ can be transferred to 100% cotton, 50/50 blends and 100% polyester/DriFit. It’s a perfect way to transfer designs onto spirit and athletic wear. RhinoDARK™ is available in 8.5″ x 11″ and 11″ x 17″. Click on SingleJet™ Opaque for step-by-step video instruction. SingleJet™ Opaque (for inkjet printers) offers full color on black and dark apparel and fabrics. 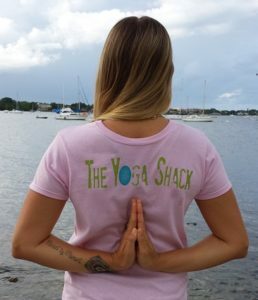 We also used it on the pink shirts at left. You’ll find a great bond to fabric once it’s transferred, as well as, durability wash after wash. SingleJet™ Opaque is available in 8.5″ x 11″ and 11″ x 17″ and there’s a very affordable 10-pack for testing purposes. For transfers onto white and light color designs, you’re especially covered in the laser heat transfer division with SingleStep™. 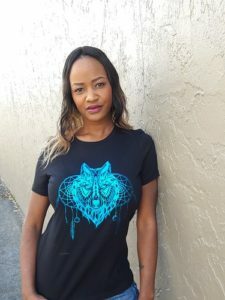 This paper offers a game-changing way to transfer custom images to garments and caps that are 100% cotton, 50/50 blends and 100% polyester/DriFit. This weedless, laser paper leaves no window, as only the toner transfers. 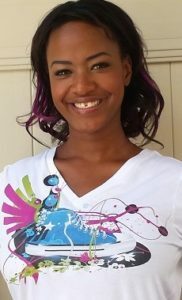 Results are T-shirts, caps and apparel with bold, brilliant color and intense black and white that appear to have been screen printed. And, you can easily add value with rhinestones and/or textile metallic foil overlays. SingleStep™ is available in 8.5” x 11” and 11” x 17”. SingleStep™ laser paper works! Click on SingleStep™ laser paper for video. We offer these specially designed laser printers from OKI Data. The 920 WT and 711 WT printers to ensure crisp CMY and white images. Our recommendations for inkjet printers are the Epson 1430 or HP. Round out your heat transfer system with these excellent performing, must-have heat presses with digital time, pressure and temp gauges to ensure consistency in heat transfer quality. The RTDK20 or the RT Swingman 20 are our recommendations. We use them in-house and find them to assure quality in a finished product. Discover how to add product value to garments with rhinestone and textile metallic foil applications overlays with all our heat transfer laser papers. 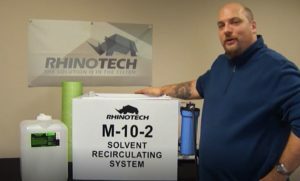 For all types of step-by-step video instructions on how to make dynamic heat transfers, check out: youtube.com/rhinotechcompany. And, connect with us at 651-686-5027 if you’l like more info, need assistance, have questions. Thanks for working with us. The May issue of A & E magazine (Awards and Engraving magazine) offers up a stellar subject, “The Many Memorial Market Opportunities: How and why you should sell memorial products” by Brenda Walsh. Though the author notes that it can be a sensitive subject, she’s discovered that this market area is building with opportunities for engravers to expand into this growing arena. And, she notes, memorial items are not just for “loss”. They also offer a way for a generous donor to be recognized, for life events to be recognized. All in all “these types of keepsakes are often treasured for years and are an enjoyable way to look back on the past”. 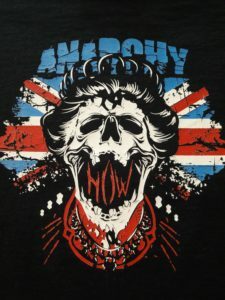 Following in that theme, we’ve also discovered a way for screen and digital printing businesses to affordably expand into this arena. Engraved-like memorabilia using SinglePrint™ heat transfer paper application is the ticket. SinglePrint™ is a weedless, laser paper that is a single sheet process. 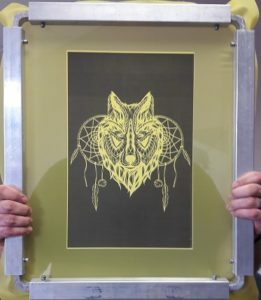 Once the design has been printed onto SinglePrint™, it transfers simply onto light color, hard surfaces, such as wood and glass plaques and plates, keepsake boxes, ceramic mugs and plates, leather and metal such as dog tags. You’ll find that copy and designs will appear defined, engraved-like and bold. A photo image of a family member, friend or pet, a hand print, a special saying and design are all possibilities. It’s another way of meeting a customer’s need and bumping up your bottom line. 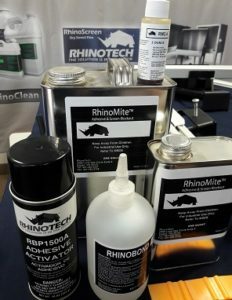 Heat Presses & More from RhinoTech. And, if you’re shopping for a heat press to offer solid, consistent results, be sure that it’s high quality with digital pressure, time and temperature gauges. You’ll especially get these results with an RT Swingman-20 or the RT DK20. They are both power-house producers. 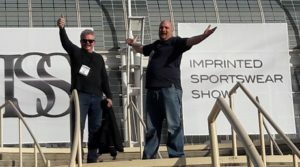 View tips, technique and a step-by-step video on how to work with SinglePrint™ HERE. 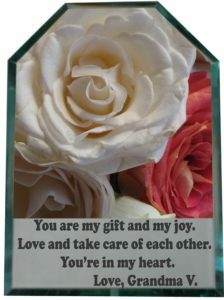 Find glass and wood plaque blanks HERE. Remember, poignant keepsakes profess tender remembrances. We really appreciate your interest in our equipment and products. 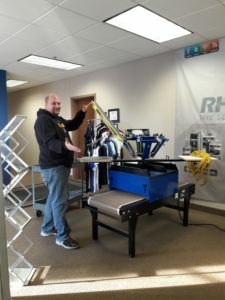 Please connect with us at 651-686-5027, info@rhinotechinc.com and www.rhinotechinc.com. Today, we’re introducing an amazing HAZE REMOVER. 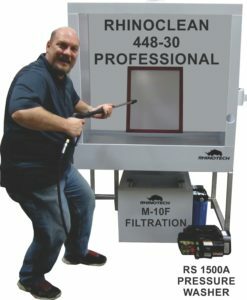 We appreciate that you’re joining us in the pit; our happy video production place where we demo RhinoClean Screen Cleaning products and other screen cleaning equipment. For this product demo of HR 2800, we’re using a RhinoClean Washout Booth that is part of our Professional Series. This booth is constructed of welded Polypro with an aluminum base that is vent ready and features a wand holder. This booth is backlit and is a no splash-back system that is an especially important feature. We also offer an Economy Series of booths in standard sizes, but, we’re always up for custom designs based on your needs. So, let’s get to it. GHOST IMAGES ON SCREENS A PROBLEM FOR YOU AT TIMES? Well, this is the most effective and simple way to eliminate them. Use HR 2800, a haze remover that is tried and proven (see Catspit Productions product comparison demo). Apply HR 2800 to the scrubber. Scrub screen frame on both sides. Let HR 2800 sit on the screen for 3 minutes. With an RS1500 Pressure Washer (225 – 1500 PSI), adjust the nozzle to the fan setting (the garden hose will not get the job done). Working back and forth in a smooth motion, spray the entire screen frame. And, watch as the haze image disappears. The result is new-looking 125 mesh screen frame. Haze Remover HR 2800 offers up a new-like screen frame for reuse. 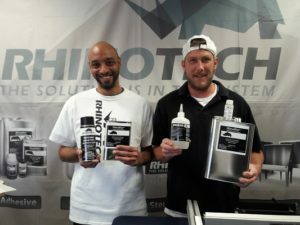 Thanks for your interest in our haze remover and all our screen cleaning and screen printing products and equipment. Emulsion Removal in a Flash. Emulsion Removal is Part 5 of a five part series (that includes Coating a Screen, Exposing/Developing a Screen, Blocking Out a Screen and Ink Removal). 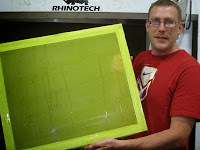 This demo targets the tips and method on how to remove the stencil from the screen frame after you’ve completed a project. And, you’re going to be wildly happy with the result. The RS1500APressure Washer that features a 26” hose, 250 – 1500 PSI, an adjustable nozzle, 110V and ground fault plug. It weighs just 60 lbs. in a very compact form and is a powerhouse of a system that just keeps on working, year after year after year. Emulsion Removal and a whole lot of other screen cleaning products. Apply ERG8550L Emulsion Remover to scrubber and scrub on both sides of screen. Once applied, the stencil will begin to break down almost immediately. In a smooth motion, continue to sweep pressure washer back and forth across the screen and experience the excitement of a new-looking screen frame coming into view! Next, let screen dry in a Screen Drying Cabinet (and, we have many to choose from). Once, dry you’re ready to reuse. It’s that simple. 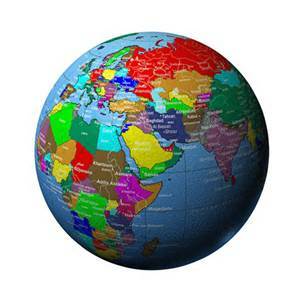 FREE SHIPPING is available on all orders of $50 or more when delivered int he contiguous U.S.A. And, we ship world-wide. Thanks for watching this and all of our other videos. We hope we have helped you lighten the load and advance your screen cleaning technique. Questions? 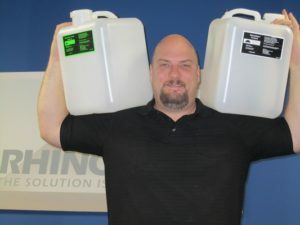 We’re here for you at 651-686-5027 x 4 or info@rhinotechinc.com.